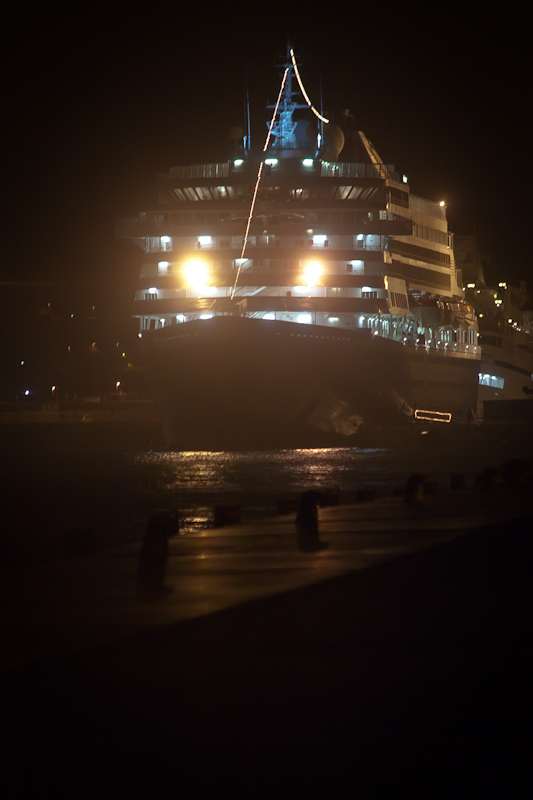 Prinsendam at night – November 2010. I’ve worked on the Prinsendam many times, sometimes up to seven cruises in a single year. I have more photos of the Prinsendam in different ports than any other single subject I can think of. Maybe one day I’ll collect together all the images I have of this one ship into a single blog post, and add to it every time I take a new one. But for now, here’s a photo of the Prinsendam in Civitavecchia, Italy. On this cruise we missed a port due to bad weather, and turned up in Civitavecchia eight hours early. I decided to take a walk off the ship at midnight, and I’m glad I did. This is one of my favourite photos of the Prinsendam, as it’s rare that I get to take photos of it at night from outside the ship.